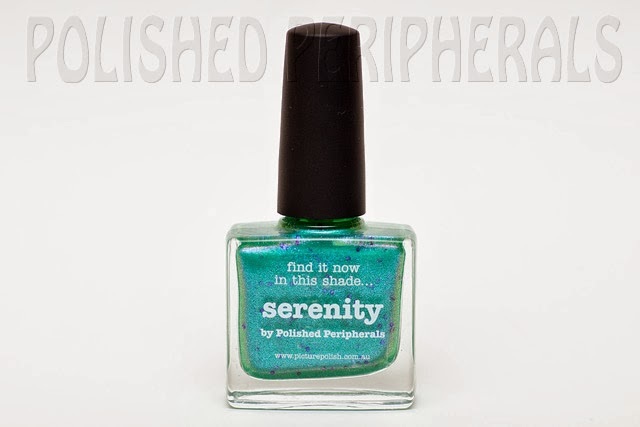 I love my collab shade, it is now my most worn polish. 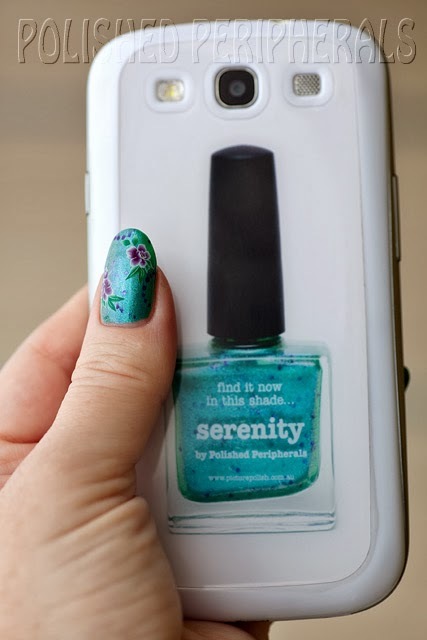 I had a phone case printed with my bottle shot so I could 'wear' it even when I'm not wearing it. I'm disappointed with the quality of the case though, the print is blurry and washed out. It actually looks better in these photos than it is. Still it's cool that it's almost life size. 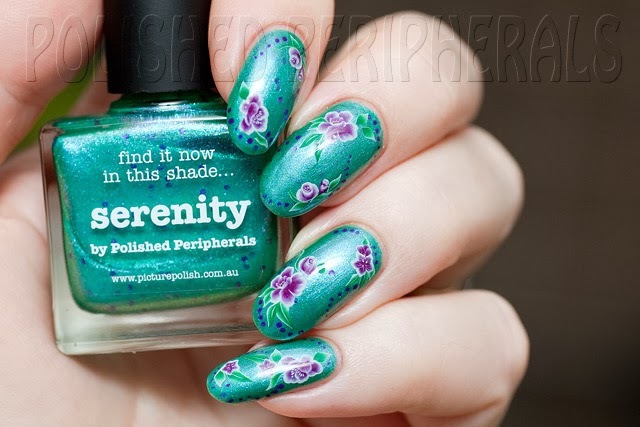 For today's post I wanted to do something pretty and delicate with Serenity so I went floral. 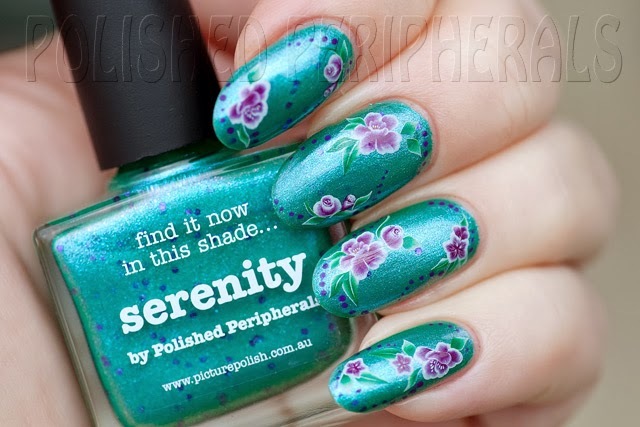 I can't help it, this polish will always make me think of flowers, in particular lavender. 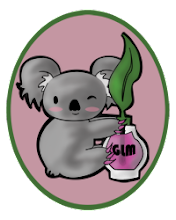 If you missed my explanation of the inspiration behind the colour have a look here. 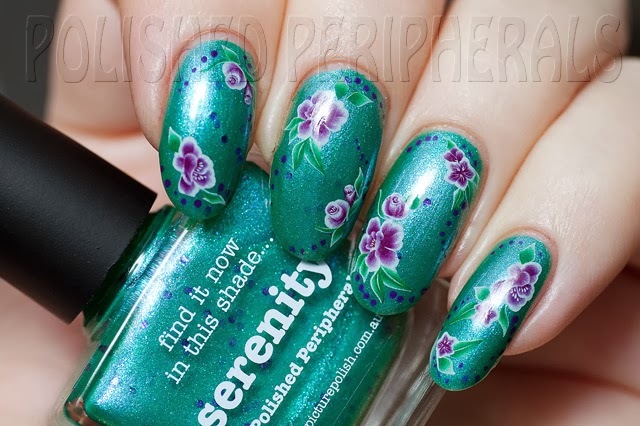 I used water decals for these flowers. My painting skills aren't good enough to do them by hand and at this time of year "ain't nobody got time for that"! 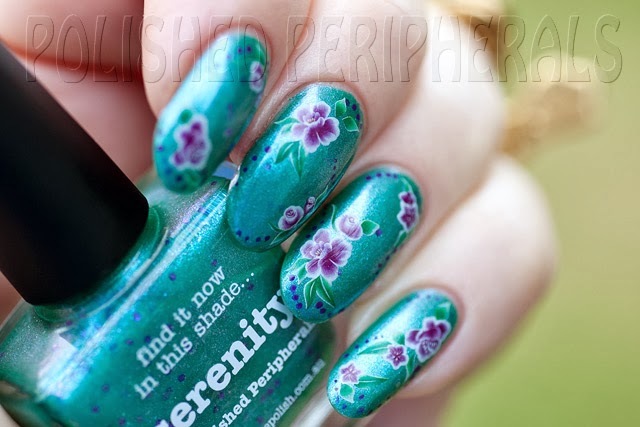 Yeh OK I did just lose 2 minutes of my life watching that but these flower decals were very quick and easy to apply. I just wish I could remember where I got them from because I want some more now. 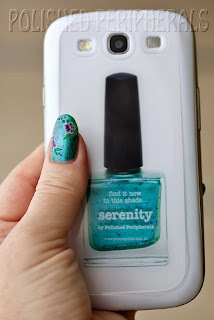 This is 2 coats of Serenity with top coat then I applied the decals, added some dots and finished with another layer of top coat. So simple for such a pretty look. I used Picture Polish Violet Femme and a toothpick to do the dots. 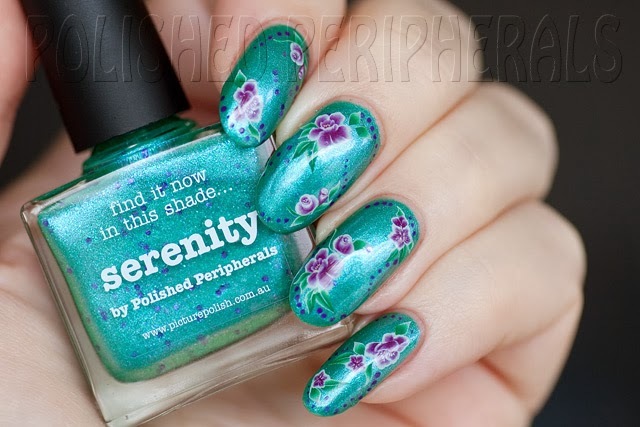 I think Violet Femme is a pretty good match for the glitters in Serenity. If you can't tell which is which have a look at my index finger. The dots around the edges are Violet Femme and the ones across the middle are actually the square lavender glitters in Serenity. Please ignore the weird bulge in the side of my middle nail. It's broken and held together with silk and gel. the break has almost grown out far enough to chop off but I didn't want to cut my nails before doing this manicure because I wanted more space for the flowers. 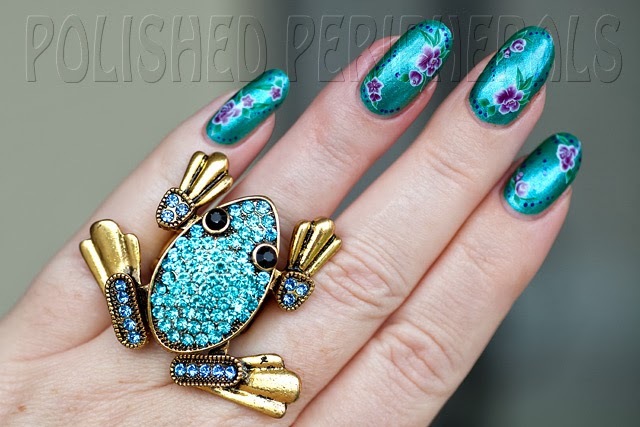 Yeh I have a frog ring and chives flowering in my garden but I just can't capture the purple shimmer of Serenity on camera. 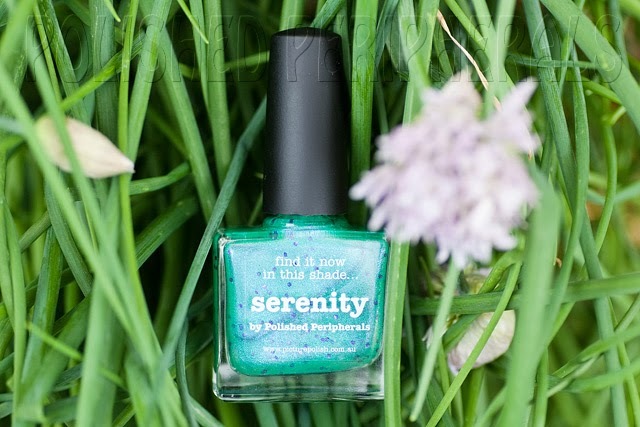 Want to see more pretty polishes?